Being a Downtown Dog means walking around on dirty sidewalks. Yuck! These booties are easy to make, can be washed, and are very green because you can make them out of your old sweatshirt, sweater, or socks. An added bonus is that your pooch will love them since they smell like you! Cut out the shape on a fold with 1/4 extra for a seam allowance. Sew on the non slip circle. Sew together the fuzzy side velcro piece, the elastic, and the hook part of the velcro, flat side up. 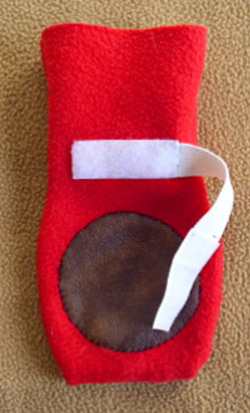 Stitch the strap onto the ankle part of the sock. Sew the sides together making sure not to catch the strap. Turn right side out. Repeat 4 times! Cut a circle to fit depending on the size of your bootie. Good materials are vinyl, leather or felt. There are lots of places in the Fashion District that have small scrapes for sale.